All stores, brands, restaurants, cinemas, offers, events, entertainment, sales in Acropolis Mall Kolkata. Acropolis will be an iconic architectural masterpiece with an elegant elevation covered with a glass facade spread over approximately 3, 00,000 sft. The shopping Mall is all set to have the right retail mix layered with various kinds of retail zones, and will also house a four screen Multiplex, food Courts, Fine Dining restaurants, Family and Children entertainment areas and more. Acropolis Mall opens on 25th September 2015 with brands like Cinepolis, Shoppers Stop, Vero Moda, Chilis, Marks & Spencer, Sunglass Hut, Asia Kitchen, Being Human, The Body Shop, KFC, Mainland China, Peter England, Mia, Jack and Jones, Fusion Beats, AND, Global Desi, W for Woman, Jashn, Parcos, Wildcraft, Dominos, Titan World, Woodland, and more. 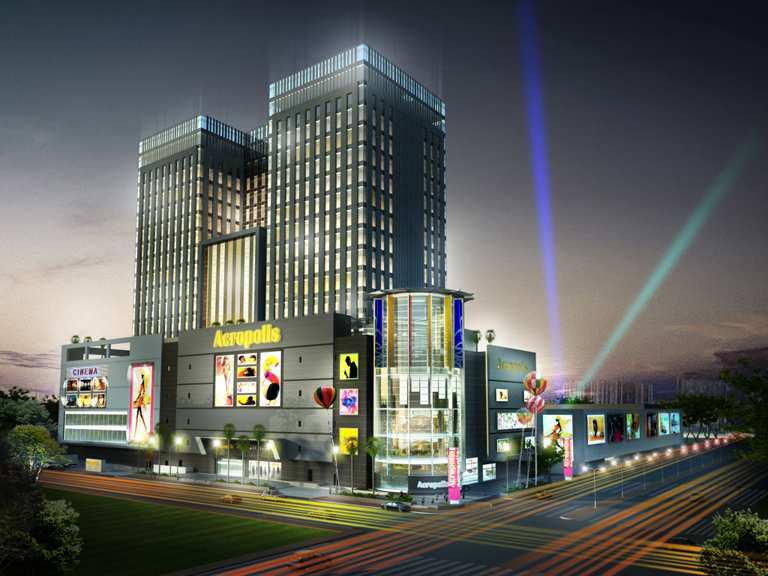 The Acropolis Mall will spread across 5 floors totaling to a gross leasable area of 2, 88,000 sft. We are in negotiation with various brands ranging from apparel, footwear, fashion and accessories and more. Three basement levels for parking are designed to accommodate 650 cars at a time. The mall will house two anchor stores of 45,000sft & 15,000sft each. All floors will be well connected by way of escalators and modern high speed passenger elevators. Over and above all these, visitors will have multiple May I help you booths and a user friendly signage system across all levels for ready guidance. For Acropolis the primary target catchments area are Gariahat, Ballygunj, Picnic Gardens, Garcha, Old Bullygunj Rash Behari Avenue, Jodhpur Park, Southern Avenue, Golpark, Kasba and Tollygunge which are just 5 to 20 minutes of driving distance and house eminent personalities alongside High Income Group people. 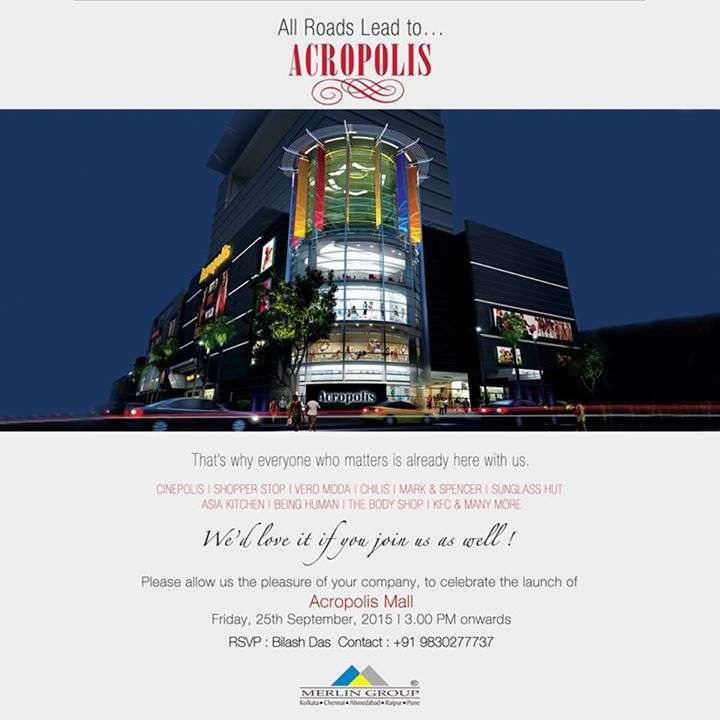 Acropolis- Presenting Fantastic Retail opportunities in Kolkata. 7 reasons why ACROPOLIS should be in your Retail Expansion Road-Map - On R. B. Connector, South Kolkata, having fantastic catchment and close to established Retail Areas. - Promoted by Merlin with the professional expertise of managing Mega Malls like South City & Homeland in Kolkata. - Secured mechanised basement parking with approx. 600 slots. - Hawk-eye exterior visibility. Acropolis is coming up in a corner plot. A unique double frontage. Seamless connectivity. - Scientific tenant mix to generate high footfall, design elements skewed towards a clear line of vision for all outlets. - Overall easy access to all retail floors through four strategically placed escalators and elevators. - Treated air, double glazed glass facade, efficient water and waste management, 24 X 7 power and high security Acropolis Mall Location - High end residential areas of Ballygunge, Bhowanipore, Golf Green, Southern Avenue, Gariahat and Jadavpur within 10 mins - Thriving commercial area like Camac Street, Park Street, Esplanade, Dalhousie, Salt Lake and Sector V (The IT Hub) within 20 mins - The airport within 30 mins - The existing five star hotels like Hyatt Regency and ITC Sonar Bangla and upcoming ones like J.W.Marriott, Holiday Inn, Taj Bengal and The Intercontinental within 10 mins - Kalighat metro within 10 mins, Howrah Rail Stn. within 50 mins and Sealdah Rail Stn. within 30 mins.